The city of Edinburgh has proved to be a fertile source of inspiration for my fiction. It was a wonderful but entirely unexpected gift. I first visited in August 2010 for the Fringe Festival. I was amazed and invigorated by the buzz on the streets and the wealth of theatre and comedy that was on offer everywhere I turned. But the first real inspiration came when I visited Mary King’s Close. For those who don’t know, this is a 17th Century street underneath the Royal Mile, used as the foundations for the building of the Royal Exchange in the 1700s, effectively forgotten about for centuries and only opened up to the public in 2003. It is essentially a time capsule, preserved exactly as it was in the 1600s, the steeply sloping streets, the tall tenements and the empty rooms that seem to positively ooze with atmosphere. A guide explained about the summer of 1645 when bubonic plague ravished the community and nobody was safe from its deadly embrace. As he spoke, I suddenly realised that I wanted to set a story here. The resulting book is Crow Boy, a time-travel adventure in which Tom Afflick, a hapless youth from Manchester, finds himself hurled back across the centuries to the heart of Mary Kings Close, where he is forced to become the assistant to an evil plague doctor. Happily, MKC took the book to their heart, allowing us to launch it there and selling copies in their gift shop. Years later, it remains one of their best-selling items and because people from all over the world visit the place, it helps to disseminate copies around the globe. When it came time for a follow up, I chanced upon another powerful inspiration - the eight miniature coffins still on display in the National Museum of Scotland. They were found by some schoolboys in 1828, hidden on the slopes of Arthur’s Seat, the extinct volcano that overlooks the city. The boys had been hunting rabbits that day but instead made an amazing discovery. Each coffin contained a tiny dressed doll. There were seventeen of them originally but the rather stupid boys decided to throw them at each other, destroying more than half of them within minutes. Luckily, their history teacher overheard them talking of what they’d done and retraced their steps, finding eight of the coffins still intact. People have speculated for many years as to who hid them up there and why, so I enlisted Tom Afflick to whizz back in time in order to solve the mystery, linking the coffins to the exploits of two of Edinburgh’s most infamous villains – Burke and Hare. 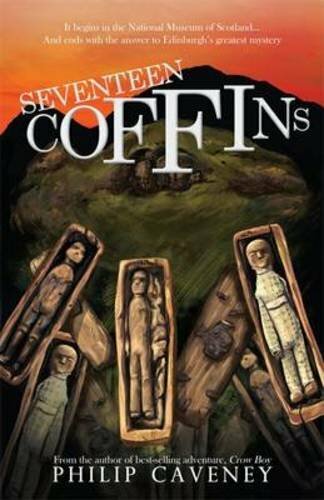 The book was called, appropriately enough, Seventeen Coffins. For the third and final story in the series, One For Sorrow, I decided to concentrate on a famous Edinburgh author – Robert Louis Stevenson. When I discovered that he had first published his seminal novel, Treasure Island in the weekly children’s magazine, Young Folks, I was intrigued, especially as he’d published the story under the pseudonym Captain George North. I quickly evolved my central premise – that Tom would have to persuade RLS to publish the story, as a book, under his own name - or the world might lose one of the greatest adventure stories of all time. I also had to find a convincing ending for Tom’s travels – one that, judging by many of the emails I received just after publication, caused more than a few tears amongst my readers. So, I had three stories all inspired by Edinburgh. What else could the city offer me? Well, over the years, I have always been impressed by the wonderful statues around the city. I have come to think of them as characters in their own right. One day, as I strolled past the monument to the Royal Scots greys on Princes Street, I found myself thinking, what if they are sentient? What if they can see and hear and feel as we mortals pass by them from day to day? What do they think of or stupid comments, the way we treat them as mere photo opportunities? And then I thought, what if there was one special day in the year, one incredible twenty four hour period when human time in Edinburgh comes to a stop and the statues are allowed to climb down from their plinths to enjoy each other’s company? The result is my latest novel, The Calling. In the book, a young boy wakes up on a train to Edinburgh. He is amazed to discover that he doesn’t know how he even came to be on the train… and worse still, he doesn’t know who he is! Things get even more confusing when he turns out to be the only human left awake at midnight, to witness the moment when every statue in the city comes to life. As a ‘softie’ he’s not very welcome. The king of the statues, Charles II is all for chopping off his head, but luckily, the boy soon finds a talented ally. The statue of Sherlock Holmes in Picardy Place is assigned to find out exactly who the boy (who the statues have nick-named Ed) is and to get him back where he came from. The statues, you see, embody all the attributes of the characters they are made to represent. As for the supporting cast, I was able to draw on some of Edinburgh’s most celebrated inhabitants – David Livingstone, Sir Walter Scott, William Wallace… even Greyfriar’s Bobbie gets to lend a paw in the proceedings. The book surprised me in some ways – as the story develops it becomes a crime novel, as it transpires that ‘Ed’ has been involved in a terrible ordeal. Things get quite dark but The Calling has garnered me some of the most positive reviews of my career. So… what next? Does Edinburgh have any more inspirations for me? Will it offer me another opportunity to delve into its illustrious past? At this stage, I can only utter those three time-honoured words.